If I had to chose a favourite K M Peyton, Blind Beauty (1999) would be well up there. When I came back to reading pony books, I hadn't realised that K M Peyton had carried on writing long after The Team and the Flambards series. Blind Beauty is one of her later books, and it picks up one of K M Peyton's best-used themes: the girl who has to fight to make sense of her life. K M Peyton's heroines don't get dealt an easy hand, and Blind Beauty's Tessa is dealt one of the nastiest of all. Her mother's married again: to Maurice, a rich but sadistic bully. Maurice can terrify Myra, Tessa's mother, into submission, but Tessa's not so easy. Maurice loathes being defied, and as Tessa's behaviour gets worse and worse, he decides to pack her off to work at a local racing stable. 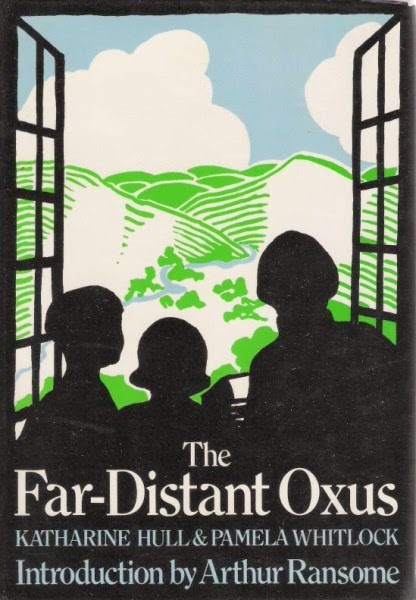 The Far-Distant Oxus isn't a classic pony book, but it's important as a book which helped define the change the genre underwent in the 1930s. It's a book full of adventure, and was one of the growing number of books where the focus was on the child and its adventures, rather than the pony. "'The ponies!' shouted Bridget, pulling back the stable door and gazing with adoring eyes at the long line of flickering tails." Today's pony book is the second in the Jinny series, A Devil to Ride (1976). Most pony books, when they have actually achieved the hard work of getting the pony, have the hard work behind them. Not Jinny. At the end of the first book, she succeeds, in nursing a Shantih almost at the point of death back to life. In A Devil to Ride Shantih is fighting fit. Jinny dreams of becoming like the pony book heroines she reads about, but her efforts to ride the recovered Shantih meet with dismal and constant failure. “Always finish your schooling on a happy note so that both rider and mount feel satisfied with what they have achieved,” Jinny quoted from her book. “So that’s what we’ll do. Not that we’ve achieved much,” she added, knowing that if she tried to take Shantih round the field twice there wouldn’t be a happy note." Monica Edwards was one of my favourite authors as a child, but she was one of those who tantalised me. Armada, who published some of her books in paperback in the 1960s, liked to advertise other titles by their authors at the end of their books. So, I knew far more books existed than I had managed to get my hands on, but though I pleaded, I was not allowed to send away the 2/6 (12 1/2 p in today's money) needed to have a copy of a book sent to me. I am not quite sure why. Maybe my mother thought once I started sending away for books in the post, there'd be no stopping me. I have no idea what she meant. I only get one or two books a week that way now. Zita White was an Australian author who wrote two pony books and two books of equine non fiction. Both her pony books appear to have been published by British, not Australian companies. Why, I'm not quite sure. The book only had one publication in the UK. It seems that the British preferred their Australian horses wild and galloping over the mountains. Elyne Mitchell's Silver Brumby series is far and away the most popular Australian horse series. Perhaps a life lived on a sheep station was just too remote for those brought up on a diet of green fields and gymkhanas. For more on Zita White, she has a page on my website. Marjorie Mary Oliver was one of the earliest writers to produce a story which focused on children rather than ponies. Her first three books, The Ponies of Bunts (1933), Sea Ponies (1935) and Ponies and Caravans (1941) are loosely connected paeans to the beauties of the countryside and its healing qualities. 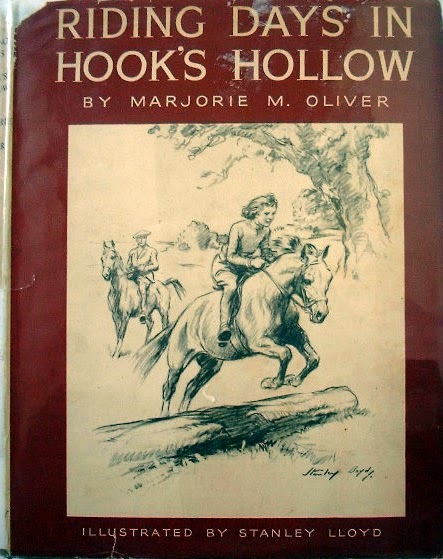 The Hook's Hollow series, of which Riding Days in Hook's Hollow (1944) was the first, dropped the photographic illustrations ("from Jenefer's camera") that were used in her first three books. I can only speculate as to why: perhaps Jenefer's camera was broken; perhaps the photographs didn't illustrate the events of the book clearly enough, or perhaps they simply weren't popular. Stanley Lloyd, a well known equine illustrator was used for the first two books, and Charlotte Hough for the third. Making an unscheduled reappearance is Ruby Ferguson's Jill Has Two Ponies. That's because it's my sister's favourite pony book, and so specially for her, here is it is. We had this version, though this isn't ours because that has just about decayed now through overuse. Our collection was a bit of a mixed bag. We had to take what we could get: no chance of getting a beautiful matching set. No one ever seemed to stock a full set of Jill titles, so we bought them whenever we could. It did take us a year or two until we got them all, and here they all are: our childhood collection. I did love the Armada cover of Jill Enjoys Her Ponies, and I'd love to know who it was by. Whoever it was, they could draw both horses and people, a rarer skill than you'd think. If I'm being really picky, Rapide wasn't a flaxen chestnut, but I didn't care. It was back to the 1970s versions for Jill's Riding Club. Back in January (which does seem alarmingly far away now), I featured the first in Gillian Baxter's Bracken House Stable series, Jump to the Stars. The Difficult Summer (1959) is the second in the series. Bobby has now left school, and is working at the stables with its owner Guy, and the other groom, Heath. When the book opens, Heath and Bobby are packing up the horse box after a successful show. Everything seems to be going well, and they enjoy the sunlit journey back. But on the way, a plane flies very low overhead: dangerously low, and then it crashes. It's hard to track down biographical information on Judith M Berrisford, and there's a very good reason for that. Judith M Berrisford was a joint name used by writers Clifford and Mary Lewis, writers of animal books for children. It is, I assume, Mary Lewis who is pictured as Judith M Berrisford on the jackets of the books. I first heard about this title when I came back to buying pony books, years after I'd originally stopped. I'd found a dealer of pony books online (Louise Simmonds of Ozbek Books - who alas no longer seems to be trading), and she had Pony Club Cup in her stock list. I was very excited because I thought Josephine Pullein-Thompson must have added some later titles to the Noel and Henry series, but Louise soon put me right. 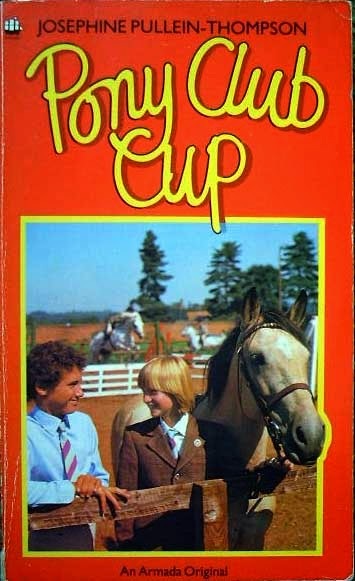 Pony Club Cup was the first of an entirely different series about an entirely different pony club. The Woodbury Pony Club are hopeless. Every other Pony Club within range treats them as a joke. And then, they get a new instructor. They're not particularly impressed with the idea of David Lumley, ex steeplechase jockey, at first, but he takes them in hand, and in true Pullein-Thompson fashion, they begin to improve their riding. Today's PBOTD is a modern book: Taking Flight (2009) by Sheena Wilkinson. Boys don't appear often in modern British horse stories, let alone disaffected, out of control teenagers from Belfast. Declan's mother is an alcoholic, and Declan is one of those boys school labels a problem right from the start. When Declan's mother is hospitalised after a particularly florid episode, Declan goes to stay with his aunt and cousin. His aunt has done well: her daughter Vicky has a horse. If you've been following the PBOTD, you'll know many of my early pony book experiences were courtesy of our local library. Every book in my early library experience was a hardback, but then paperbacks began to be introduced. Except they'd been converted: hard covers had been bonded to the inside of the covers, and shiny plastic film applied over the whole lot. I remember Horse in the House being my first experience of the form, and how odd it looked. Paperbacks treated like that always look oddly apologetic: they seem to know they've been forced out of their usual form. They could have bound Horse in the House in woven straw and I wouldn't have cared. I loved that book, and I have only to see the cover to be transported back to the place in the library where it lived. I could draw you a map. I really enjoyed this. 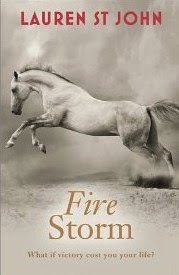 If you follow my blog, you will know I didn't like the first two volumes of this series, The One Dollar Horseand Race the Wind, and I wasn't expecting to like Fire Storm. In the previous volumes, I've had issues with unlikely plot lines and what seemed to me dodgy characterisation. I will just say that it is of course crashingly unlikely that someone will achieve the Triple Crown before they're 18, which is the whole point of this trilogy, but let's just leave that aside. The pony book is all about wish fulfilment, and this trilogy achieves that. After all, one of the earliest precursors of the genre, Velvet Brown, did win the Grand National. And she wasn't even 17. I had three of Josephine Pullein-Thompson's Noel and Henry series as a child. Of the other two in the series, I never did manage to find The Radney Riding Club, but I managed to read Six Ponies once, before it disappeared from the library, in the way that books sometimes did, victims of some purge I never understood. The book took on a sort of mythical existence: I knew it existed, because I'd read it, but I couldn't find it again, no matter where I looked. Eventually, when I moved on from pony books, I forgot about Six Ponies. Today's pony book is by an Australian author. 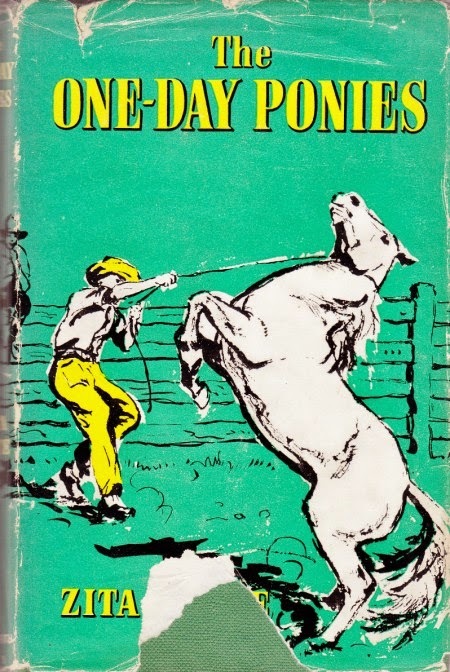 Originally published as A Sporting Proposition in 1973, James Aldridge's book was taken up by Disney, who turned it into a film called Ride a Wild Pony in 1975. Under this title, the book took on a new life and was published several more times. It's the story of a pony who disappears, and two radically different children. The pony, Taff, is given to Scott Pirie, the town's trouble-maker, so he can ride it to school. Boy and pony are inseparable, but then Taff disappears to join the wild ponies. When he turns up again, he's pulling a trap. The trap is owned by Eyre, the man who gave Scott Taff in the first place, and that trap is driven by Jo, Eyre's daughter, who can't walk. The whole thing ends up with a town divided, and a court case.